Bus diplomacy. Cricket diplomacy. Handshake diplomacy. Now, birthday diplomacy. India and Pakistan excel in unpredictability and abnormality. Sometimes, they are so hostile their leaders refuse to even shake hands, other times they go for the bear hug. As Narendra Modi and Nawaz Sharif just did. Indian and Pakistani leaders have strange ways of projecting to the world that when they so desire, they can meet and generate sparkling lights of optimism. Although the hoopla created by such initiatives does not last long, they surely generate, for whatever it's worth, the excitement and hope that's so badly missing in the bilateral relations. In Pakistan, 25 December is a day of solemn reflection on the ideals and teachings of Muhammad Ali Jinnah, the founder of the nation. His birth anniversary falls on Christmas Day, when most citizens felicitate their Christian fellow citizens. It also happens to be Nawaz Sharif's birthday. So, for his supporters, it's a three-event celebration day. As usual, the TV channels were keeping their viewers occupied with programmes on Jinnah and Christmas. Then came the breaking news, more of a bombshell really. The Prime Minister of India, Narendra Modi, was about to make a pit stop in Lahore on his way home from Kabul. Why? To convey his best wishes to Sharif on his birthday and the wedding of his granddaughter. Personal diplomacy it was called. But, of course, when it comes to India and Pakistan, such exchanges are anything but personal. They have ramifications for not just the two neighbours, but the wider region as well. So, what do we take from this bonhomie? Is the ice melting? First the brief meeting in Paris, then the National Security Advisors talks in Bangkok, the Heart of Asia meeting in Islamabad, and now Modi visiting Lahore/Raiwind for a birthday/wedding bash? 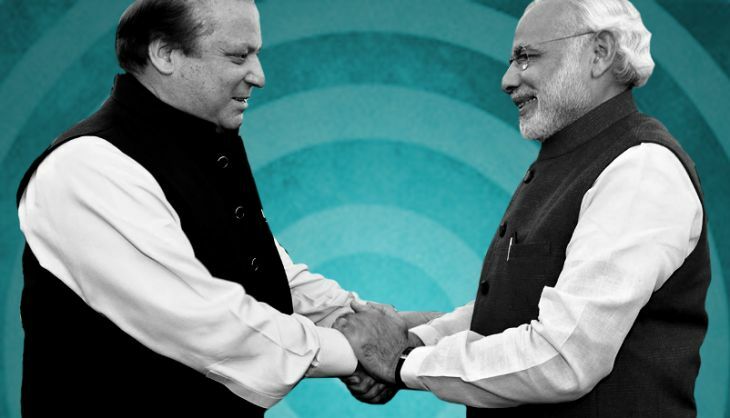 All of a sudden, the Indo-Pak bilateral scenario is looking up. It doesn't get better than that. Hold on, say the critics. Not so fast. Didn't you hear Modi blaming Pakistan for cross-border terrorism even while Sharif was on his way to the airport to receive him? And where were the two NSAs at the meeting? Where was the media? What was the agenda - Kashmir, Siachen, MFN status, Afghanistan, terror, border conflict, cricket? Or were only pleasantries exchanged while they partook of cashew, almond and pistachio nuts and tea? Sharif played the perfect host by keeping contentious issues out of the festivities of the day. He welcomed a neighbour, albeit a foe, accorded him all protocol, and accepted his felicitations and good wishes, as it should be done. So, why the carping and ranting and raving by critics on both sides of the border? Because two categories of people had their day spoiled - the fundamentalists belonging to politico-religious parties and the retired uniformed personnel. The fundamentalists can't fathom peace in the region. The retired officers of the Indian and Pakistani armed forces, living comfortably on pensions and investments and having no golf to play, spend their evenings on TV talk shows. Thus anointed expert analysts, they usually see red in everything that's done to normalise bilateral relations and usher in peace. Predictably, they pounced on the latest initiative like raging bulls. For, they knew this small step by Modi might turn out to be a giant leap for the denizens of the sub-continent. This is not to say that those vehemently opposed to easing of the relations, especially in Pakistan, don't have some genuine complaints. There is India's opposition to the China Pakistan Economic Corridor, its involvement in the Balochistan insurgency, its incessant accusations that Pakistan is fomenting terrorism, the use of non-tariff trade barriers to prevent Pakistani products from having a level playing field, and the refusal to allow the two nations' cricket teams play. But leave aside the conspiracy theories. Forget who initiated the Birthday Diplomacy. Disregard belligerent outbursts of the so-called analysts. Think positive. This was no selling out by anyone nor was it a Composite Dialogue. It was a much desired goodwill gesture by both the leaders. For crying out loud, even an estranged paternal aunt shows up at weddings. If nobody else, industrialists and traders are in a bullish mood. Sajjan Jindal, the Indian steel tycoon, became a role model overnight. The game-changing role that Godrej or Ambani in India or Mian Mansha and SM Muneer in Pakistan did not play, Jindal did it, or so they say. Also read: Did Narendra Modi inform Arnab Goswami before leaving for Lahore? The naysayers claim the "steel" connection - a hint at the Sharif family's steel interests - enabled the tycoon to be the go-between. So what? The journalist Barkha Dutt has revealed that Jindal had also arranged for Modi and Sharif to meet during the SAARC Summit in Kathmandu in 2014. While FPCCI, FICCI, or SAARC CCI just talked and issued position papers and resolutions, Jindal actually did it, or so they say. Trade and industry leaders are optimistic that the trade normalisation process would pick up momentum, the visa regime would be liberalised and, maybe, banks would be allowed to set up branches across the border. Munabao-Khokhrapar route may be allowed to function, while Special Economic Zones along the border are a distinct possibility. The consensus among businessmen here is that although India should not be allowed transit passage to Afghanistan, many are open to the idea of India using Gwadar Port and the China Pakistan Economic Corridor to access the land-locked country. What next? For one, the foreign secretaries are meeting on January 15 to resume the dialogue process. It's imperative that nothing is allowed to stop the dialogue again - no excuses, no hard posturing, no back-pedaling. The future of the sub-continent is stake. The writer is former president, Karachi Chamber of Commerce and Industry.